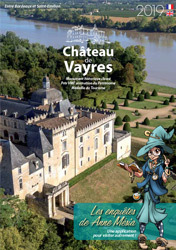 Lying about 15 miles from Bordeaux on the way to Saint-Emilion The Château de Vayres, set in listed ground of outstanding beauty, the Dordogne flowing by, is one of the most prestigious historic buildings of the Aquitaine. Since the medieval ages the Vayres Estate belonged to the great Albret family, kings of Navarre (1300 to 1580). Then the estate is inherited by Henri IV, king of France, the most famous of this family. The medieval castle was renovated during the renaissance period and around 1690. Formal gardens and medieval gardens. « Chevaliers et Mousquetaires » on 3/8 and 4/8. The Estate is open for individuals from Easter to All Saints Days. Guided tours at 3pm – 4pm – 5pm. Guided tours at 3pm and 4pm . Groups : The castle is open every day by reservation only. Located about fifteen kilometres from Bordeaux on the way to St Emilion, Vayres can be easily reached by car. Take the RN89 motorway, then follow signs to Libourne. The nearest motorway exit to the Château is Exit No.7 signposted to Vayres village.